The emu (Dromaius novaehollandiae) is the second-largest living bird by height, after its ratite relative, the ostrich. It is endemic to Australia where it is the largest native bird and the only extant member of the genus Dromaius. The emu's range covers most of mainland Australia, but the Tasmanian, Kangaroo Island and King Island subspecies became extinct after the European settlement of Australia in 1788. The bird is sufficiently common for it to be rated as a least-concern species by the International Union for Conservation of Nature. 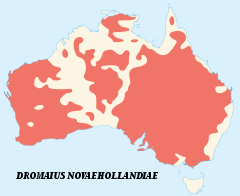 Two different Dromaius species were present in Australia at the time of European settlement, and one additional species is known from fossil remains. 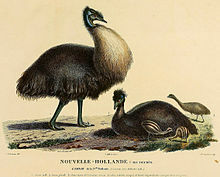 The insular dwarf emus, D. n. baudinianus and D. n. minor, originally present on Kangaroo Island and King Island respectively, both became extinct shortly after the arrival of Europeans. D. n. diemenensis, another insular dwarf emu from Tasmania, became extinct around 1865. However, the mainland subspecies, D. n. novaehollandiae, remains common. The population of these birds varies from decade to decade, largely being dependent on rainfall; in 2009, it was estimated that there were between 630,000 and 725,000 birds. Emus were introduced to Maria Island  off Tasmania, and Kangaroo Island off the coast of South Australia, during the 20th century. The Maria Island population died out in the mid-1990s. The Kangaroo Island birds have successfully established a breeding population. The emu is the second tallest bird in the world, only being exceeded in height by the ostrich; the largest individuals can reach up to 150 to 190 cm (59 to 75 in) in height. Measured from the bill to the tail, emus range in length from 139 to 164 cm (55 to 65 in), with males averaging 148.5 cm (58.5 in) and females averaging 156.8 cm (61.7 in). Emus are the fourth or fifth heaviest living bird after the two species of ostrich and two larger species of cassowary, weighing slightly more on average than an emperor penguin. Adult emus weigh between 18 and 60 kg (40 and 132 lb), with an average of 31.5 and 37 kg (69 and 82 lb) in males and females, respectively. Females are usually slightly larger than males and are substantially wider across the rump. 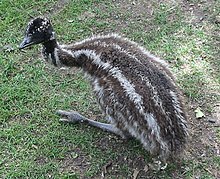 Although flightless, emus have vestigial wings, the wing chord measuring around 20 cm (8 in), and each wing having a small claw at the tip. Emus flap their wings when running, perhaps as a means of stabilising themselves when moving fast. They have long necks and legs, and can run at speeds of 48 km/h (30 mph) due to their highly specialised pelvic limb musculature. 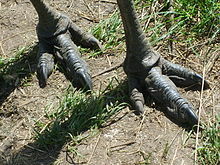 Their feet have only three toes and a similarly reduced number of bones and associated foot muscles; emus are unique among birds in that their gastrocnemius muscles in the back of the lower legs have four bellies instead of the usual three. The pelvic limb muscles of emus contribute a similar proportion of the total body mass as do the flight muscles of flying birds. When walking, the emu takes strides of about 100 cm (3.3 ft), but at full gallop, a stride can be as long as 275 cm (9 ft). Its legs are devoid of feathers and underneath its feet are thick, cushioned pads. Like the cassowary, the emu has sharp claws on its toes which are its major defensive attribute, and are used in combat to inflict wounds on opponents by kicking. The toe and claw total 15 cm (6 in) in length. The bill is quite small, measuring 5.6 to 6.7 cm (2.2 to 2.6 in), and is soft, being adapted for grazing. Emus have good eyesight and hearing, which allows them to detect threats at some distance. The eyes of an emu are protected by nictitating membranes. These are translucent, secondary eyelids that move horizontally from the inside edge of the eye to the outside edge. They function as visors to protect the eyes from the dust that is prevalent in windy arid regions. Emus have a tracheal pouch, which becomes more prominent during the mating season. At more than 30 cm (12 in) in length, it is quite spacious; it has a thin wall, and an opening 8 centimetres (3 in) long. Once common on the east coast of Australia, emus are now uncommon there; by contrast, the development of agriculture and the provision of water for stock in the interior of the continent have increased the range of the emu in arid regions. Emus live in various habitats across Australia both inland and near the coast. They are most common in areas of savannah woodland and sclerophyll forest, and least common in heavily populated districts and arid areas with annual precipitation of less than 600 millimetres (24 in). Emus predominately travel in pairs, and while they can form large flocks, this is an atypical social behaviour that arises from the common need to move towards a new food source. Emus have been shown to travel long distances to reach abundant feeding areas. In Western Australia, emu movements follow a distinct seasonal pattern – north in summer and south in winter. On the east coast their wanderings seem to be more random and do not appear to follow a set pattern. Emus drink infrequently, but ingest large amounts when the opportunity arises. They typically drink once a day, first inspecting the water body and surrounding area in groups before kneeling down at the edge to drink. They prefer being on firm ground while drinking, rather than on rocks or mud, but if they sense danger, they often stand rather than kneel. If not disturbed, they may drink continuously for ten minutes. 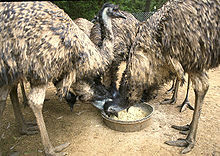 Due to the scarcity of water sources, emus are sometimes forced to go without water for several days. In the wild, they often share water holes with kangaroos, other birds and animals; they are wary and tend to wait for the other animals to leave before drinking. The comedian Rod Hull featured a wayward emu puppet in his act for many years and the bird returned to the small screen in the hands of his son after the puppeteer's death in 1999. 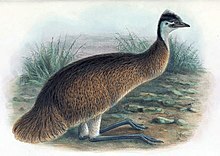 In John Gould's Handbook to the Birds of Australia, first published in 1865, he lamented the loss of the emu from Tasmania, where it had become rare and has since become extinct; he noted that emus were no longer common in the vicinity of Sydney and proposed that the species be given protected status. In the 1930s, emu killings in Western Australia peaked at 57,000, and culls were also mounted in Queensland during this period due to rampant crop damage. In the 1960s, bounties were still being paid in Western Australia for killing emus, but since then, wild emus have been granted formal protection under the Environment Protection and Biodiversity Conservation Act 1999. Their occurrence range is between 4,240,000 and 6,730,000 km2 (1,640,000–2,600,000 sq mi), and a 1992 census suggested that their total population was between 630,000 and 725,000. As of 2012[update], the International Union for Conservation of Nature considers their population trend to be stable and assesses their conservation status as being of least concern. The isolated emu population of the New South Wales North Coast Bioregion and Port Stephens is listed as endangered by the New South Wales Government. ^ Patterson, C.; Rich, Patricia Vickers (1987). "The fossil history of the emus, Dromaius (Aves: Dromaiinae)". Records of the South Australian Museum. 21: 85–117. ^ a b c d e BirdLife International (2012). "Dromaius novaehollandiae". IUCN Red List of Threatened Species. Version 2013.2. International Union for Conservation of Nature. Retrieved 14 July 2015. ^ a b c d Davies, S.J.J.F. (2003). "Emus". In Hutchins, Michael (ed.). Grzimek's Animal Life Encyclopedia. 8 Birds I Tinamous and Ratites to Hoatzins (2nd ed.). Farmington Hills, Michigan: Gale Group. pp. 83–87. ISBN 978-0-7876-5784-0. ^ a b Brands, Sheila (14 August 2008). "Systema Naturae 2000 / Classification, Dromaius novaehollandiae". Project: The Taxonomicon. Archived from the original on 10 March 2016. Retrieved 14 July 2015. ^ a b c d "Names List for Dromaius novaehollandiae (Latham, 1790)". Department of the Environment, Water, Heritage and the Arts. Archived from the original on 14 July 2015. Retrieved 14 July 2015. ^ Robert, Willem Carel Hendrik (1972). The explorations, 1696-1697, of Australia by Willem De Vlamingh. Philo Press. p. 140. ISBN 978-90-6022-501-1. ^ a b c d Eastman, p. 5. ^ a b Gould, John (1865). Handbook to the Birds of Australia. 2. London. pp. 200–203. ^ Philip, Arthur (1789). The voyage of Governor Phillip to Botany Bay. London: Printed by John Stockdale. pp. 271–272. ^ Latham, John (1790). Index Ornithologicus, Sive Systema Ornithologiae: Complectens Avium Divisionem In Classes, Ordines, Genera, Species, Ipsarumque Varietates (Volume 2) (in Latin). London: Leigh & Sotheby. p. 665. ^ Gotch, A.F. (1995) . "16". Latin Names Explained. A Guide to the Scientific Classifications of Reptiles, Birds & Mammals. Facts on File. p. 179. ISBN 978-0-8160-3377-5. ^ Vieillot, Louis Jean Pierre (1816). Analyse d'une nouvelle ornithologie élémentaire, par L.P. Vieillot. Deteville, libraire, rue Hautefeuille. pp. 54, 70. ^ Alexander, W.B. (1927). "Generic name of the Emu". Auk. 44 (4): 592–593. doi:10.2307/4074902. JSTOR 4074902. ^ a b c d e Boles, Walter (6 April 2010). "Emu". Australian Museum. Retrieved 18 July 2015. ^ McClymont, James R. "The etymology of the name 'emu'". readbookonline.net. Archived from the original on 21 April 2015. Retrieved 5 August 2015. ^ Mathew, John (1899). Eaglehawk and crow a study of the Australian aborigines including an inquiry into their origin and a survey of Australian languages. Рипол Классик. p. 159. ISBN 978-5-87986-358-1. ^ Troy, Jakelin (1993). The Sydney language. Canberra: Jakelin Troy. p. 54. ISBN 978-0-646-11015-8. ^ Christidis, Les; Boles, Walter (2008). Systematics and Taxonomy of Australian Birds. Csiro Publishing. p. 57. ISBN 978-0-643-06511-6. ^ Tudge, Colin (2009). The Bird: A Natural History of Who Birds Are, Where They Came From, and How They Live. Random House Digital. p. 116. ISBN 978-0-307-34204-1. ^ Mitchell, K.J. ; Llamas, B.; Soubrier, J.; Rawlence, N.J.; Worthy, T.H. ; Wood, J.; Lee, M.S.Y. ; Cooper, A. (2014). "Ancient DNA reveals elephant birds and kiwi are sister taxa and clarifies ratite bird evolution" (PDF). Science. 344 (6186): 898–900. Bibcode:2014Sci...344..898M. doi:10.1126/Science.1251981. PMID 24855267. ^ a b Heupink, Tim H.; Huynen, Leon; Lambert, David M. (2011). "Ancient DNA suggests dwarf and 'giant' emu are conspecific". PLoS ONE. 6 (4): e18728. Bibcode:2011PLoSO...618728H. doi:10.1371/journal.pone.0018728. PMC 3073985. PMID 21494561. ^ a b "Emu Dromaius novaehollandiae". BirdLife International. Retrieved 26 June 2015. ^ Williams, W.D. (2012). Biogeography and Ecology in Tasmania. Springer Science & Business Media. p. 450. ISBN 978-94-010-2337-5. ^ Frith, Harold James (1973). Wildlife conservation. Angus and Robertson. p. 308. ^ Mathews, Gregory M. (1912). "Class: Aves; Genus Dromiceius". Novitates Zoologicae. XVIII (3): 175–176. ^ "Emu (South Eastern): Dromaius novaehollandiae [novaehollandiae or rothschildi] (= Dromaius novaehollandiae novaehollandiae) (Latham, 1790)". Avibase. Retrieved 5 September 2015. ^ "Emu (Northern): Dromaius novaehollandiae novaehollandiae (woodwardi) (= Dromaius novaehollandiae woodwardi) Mathews, 1912". Avibase. Retrieved 5 September 2015. ^ "Emu (South Western): Dromaius novaehollandiae rothschildi Mathews, 1912". Avibase. Retrieved 5 September 2015. ^ Gill, Frank; Donsker, David (eds.). "Subspecies Updates". IOC World Bird List, v 5.2. Retrieved 14 July 2015. ^ Gillespie, James; Flanders, Frank (2009). Modern Livestock & Poultry Production. Cengage Learning. p. 908. ISBN 978-1-4283-1808-3. ^ a b c d e f g h i j k l m n Stephen Davies (2002). Ratites and Tinamous. ISBN 978-0-19-854996-3. ^ a b c d e f Eastman, p. 6. ^ Patak, A.E. ; Baldwin, J. (1998). "Pelvic limb musculature in the emu Dromaius novaehollandiae (Aves : Struthioniformes: Dromaiidae): Adaptations to high-speed running". Journal of Morphology. 238 (1): 23–37. doi:10.1002/(SICI)1097-4687(199810)238:1<23::AID-JMOR2>3.0.CO;2-O. PMID 9768501. ^ a b c d e Eastman, p. 9. ^ "Emus vs. Ostriches". Wildlife Extra. Retrieved 19 July 2015. ^ Maloney, S.K. ; Dawson, T.J. (1995). "The heat load from solar radiation on a large, diurnally active bird, the emu (Dromaius novaehollandiae)". Journal of Thermal Biology. 20 (5): 381–387. doi:10.1016/0306-4565(94)00073-R.
^ a b c d Eastman, p. 23. ^ a b c d Coddington, Catherine L.; Cockburn, Andrew (1995). "The mating system of free-living emus". Australian Journal of Zoology. 43 (4): 365–372. doi:10.1071/ZO9950365. ^ a b c Davies, S.J.J.F. (1976). "The natural history of the emu in comparison with that of other ratites". In Firth, H.J. ; Calaby, J.H. (eds.). Proceedings of the 16th international ornithological congress. Australian Academy of Science. pp. 109–120. ISBN 978-0-85847-038-5. ^ Ekesbo, Ingvar (2011). Farm Animal Behaviour: Characteristics for Assessment of Health and Welfare. CABI. pp. 174–190. ISBN 978-1-84593-770-6. ^ a b c d Immelmann, K. (1960). "The sleep of the emu". Emu. 60 (3): 193–195. doi:10.1071/MU960193. ^ Maloney, S.K. ; Dawson, T.J. (1994). "Thermoregulation in a large bird, the emu (Dromaius novaehollandiae)". Comparative Biochemistry and Physiology B. 164 (6): 464–472. doi:10.1007/BF00714584. ^ Maloney, S.K. ; Dawson, T.J. (1998). 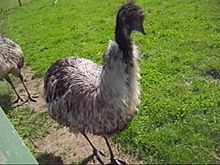 "Ventilatory accommodation of oxygen demand and respiratory water loss in a large bird, the emu (Dromaius novaehollandiae), and a re-examination of ventilatory allometry for birds". Physiological Zoology. 71 (6): 712–719. doi:10.1086/515997. PMID 9798259. ^ a b c d e Maloney, Shane K. (2008). "Thermoregulation in ratites: a review". Australian Journal of Experimental Agriculture. 48 (10): 1293–1301. doi:10.1071/EA08142. ^ Barker, R.D. ; Vertjens, W.J.M. (1989). The Food of Australian Birds: 1 Non-Passerines. CSIRO Australia. ISBN 978-0-643-05007-5. ^ a b c d Eastman, p. 44. ^ a b Powell, Robert (1990). Leaf and branch: Trees and tall shrubs of Perth. Department of Conservation and Land Management. p. 197. ISBN 978-0-7309-3916-0. ^ a b Eastman, p. 31. ^ McGrath, R.J.; Bass, D. (1999). "Seed dispersal by emus on the New South Wales north-east coast". Emu. 99 (4): 248–252. doi:10.1071/MU99030. ^ "The prickly pear story" (PDF). Department of Employment, Economic Development and Innovation, State of Queensland. 2015. Retrieved 21 July 2015. ^ a b Eastman, p. 15. ^ Malecki, I.A. ; Martin, G.B. ; O'Malley, P.J. ; Meyer, G.T. ; Talbot, R.T.; Sharp, P.J. (1998). "Endocrine and testicular changes in a short-day seasonally breeding bird, the emu (Dromaius novaehollandiae), in southwestern Australia". Animal Reproduction Science. 53 (1–4): 143–155. doi:10.1016/S0378-4320(98)00110-9. PMID 9835373. ^ a b Eastman, p. 24. ^ a b Patodkar, V.R. ; Rahane, S.D. ; Shejal, M.A. ; Belhekar, D.R. (2011). "Behavior of emu bird (Dromaius novaehollandiae)". Veterinary World. 2 (11): 439–440. ^ Campbell, Bruce; Lack, Elizabeth (2013). A Dictionary of Birds. Bloomsbury Publishing. p. 179. ISBN 978-1-4081-3839-7. ^ Dzialowski, Edward M.; Sotherland, Paul R. (2004). "Maternal effects of egg size on emu Dromaius novaehollandiae egg composition and hatchling phenotype". Journal of Experimental Biology. 207 (4): 597–606. doi:10.1242/jeb.00792. ^ Bassett, S.M. ; Potter, M.A. ; Fordham, R.A.; Johnston, E.V. (1999). "Genetically identical avian twins". Journal of Zoology. 247 (4): 475–478. doi:10.1111/j.1469-7998.1999.tb01010.x. ^ a b Eastman, p. 25. ^ Royal Australasian Ornithologists' Union (1956). The Emu. The Union. p. 408. ^ Taylor, Emma L.; Blache, Dominique; Groth, David; Wetherall, John D.; Martin, Graeme B. (2000). "Genetic evidence for mixed parentage in nests of the emu (Dromaius novaehollandiae)". Behavioral Ecology and Sociobiology. 47 (5): 359–364. doi:10.1007/s002650050677. JSTOR 4601755. ^ a b Eastman, p. 26. ^ a b Reader's Digest Complete Book of Australian Birds. Reader's Digest Services. 1978. ISBN 978-0-909486-63-1. ^ a b Eastman, p. 29. ^ Caughley, G.; Grigg, G.C. ; Caughley, J.; Hill, G.J.E. (1980). "Does dingo predation control the densities of kangaroos and emus?". Australian Wildlife Research. 7: 1–12. CiteSeerX 10.1.1.534.9972. doi:10.1071/WR9800001. ^ Nemejc, Karel; Lukešová, Daniela (2012). "The parasite fauna of ostriches, emu and rheas". Agricultura Tropica et Subtropica. 54 (1): 45–50. doi:10.2478/v10295-012-0007-6. ^ a b c d Eastman, p. 63. ^ ""Emu War" defended". The Argus. 19 November 1932. p. 22. Retrieved 19 July 2015. ^ "Attacked by an emu". The Argus. 10 August 1904. p. 8. Retrieved 15 July 2015. ^ "Victoria". The Mercury. 24 March 1873. p. 2. Retrieved 15 July 2015. ^ Turner, Margaret–Mary (1994). Arrernte Foods: Foods from Central Australia. Alice Springs, Northern Territory: IAD Press. p. 47. ISBN 978-0-949659-76-7. ^ Nicholls, Jason (1998). Commercial emu raising : using cool climate forage based production systems : a report for the Rural Industries Research and Development Corporation. Barton, A.C.T. : Rural Industries Research and Development Corp. ISBN 978-0-642-57869-3. Archived from the original on 15 July 2015. Retrieved 15 July 2015. ^ a b c "Ratites (Emu, Ostrich, and Rhea)". United States Department of Agriculture. 2 August 2013. Retrieved 15 July 2015. ^ Davis, Gary S. (29 May 2007). "Commercial Emu Production". North Carolina Cooperative Extension Service. Retrieved 30 July 2015. ^ Saravanan, L. (21 April 2012). "Don't invest in Emu farms, say Salem authorities". The Times of India. Retrieved 15 July 2015. ^ a b Robbins, Jim (7 February 2013). "Ranchers find hope in flightless bird's fat". The New York Times. Retrieved 8 February 2013. ^ a b c d e Howarth, Gordon S.; Lindsay, Ruth J.; Butler, Ross N.; Geier, Mark S. (2008). "Can emu oil ameliorate inflammatory disorders affecting the gastrointestinal system?". Australian Journal of Experimental Agriculture. 48 (10): 1276–1279. doi:10.1071/EA08139. ^ a b Yoganathan, S.; Nicolosi, R.; Wilson, T.; Handelman, G.; Scollin, P.; Tao, R.; Binford, P.; Orthoefer, F. (2003). "Antagonism of croton oil inflammation by topical emu oil in CD-1 mice". Lipids. 38 (6): 603–607. doi:10.1007/s11745-003-1104-y. PMID 12934669. ^ Kurtzweil, Paula (25 February 2010). "How to Spot Health Fraud". Drugs. U.S. Food and Drug Administration. Retrieved 15 July 2015. ^ a b c Bennett, Darin C.; Code, William E.; Godin, David V.; Cheng, Kimberly M. (2008). "Comparison of the antioxidant properties of emu oil with other avian oils". Australian Journal of Experimental Agriculture. 48 (10): 1345–1350. doi:10.1071/EA08134. ^ Politis, M.J.; Dmytrowich, A. (1998). "Promotion of second intention wound healing by emu oil lotion: comparative results with furasin, polysporin, and cortisone". Plastic and Reconstructive Surgery. 102 (7): 2404–2407. doi:10.1097/00006534-199812000-00020. PMID 9858176. ^ Whitehouse, M.W. ; Turner, A.G.; Davis, C.K. ; Roberts, M.S. (1998). "Emu oil(s): A source of non-toxic transdermal anti-inflammatory agents in aboriginal medicine". Inflammopharmacology. 6 (1): 1–8. doi:10.1007/s10787-998-0001-9. PMID 17638122. 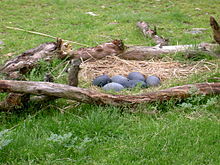 ^ "Kalti Paarti - Carved emu eggs". National Museum of Australia. Retrieved 15 July 2015. ^ Dixon, Roland B. (1916). "Australia". Oceanic Mythology. Bibliobazaar. pp. 270–275. ISBN 978-0-8154-0059-2. ^ Norris, Ray P.; Hamacher, Duane W. (2010). "Astronomical Symbolism in Australian Aboriginal Rock Art". Rock Art Research. 28 (1): 99. arXiv:1009.4753. Bibcode:2011RArtR..28...99N. ^ a b "Australia's National Symbols". Department of Foreign Affairs and Trade. Retrieved 15 July 2015. ^ "Fifty cents". Royal Australian Mint. 2010. Retrieved 18 July 2015. ^ "Emu Stamps". Bird stamps. Birdlife International. Retrieved 18 July 2015. ^ "Tabulam and the Light Horse Tradition". Australian Light Horse Association. 2011. Retrieved 18 July 2015. ^ "Place Names Search Result". Geoscience Australia. 2004. Archived from the original on 9 December 2012. Retrieved 18 July 2015. ^ Spiller, Geoff; Norton, Suzanna (2003). Micro-Breweries to Monopolies and Back: Swan River Colony Breweries 1829-2002. Western Australian Museum. ISBN 978-1-920843-01-4. ^ "Emu: Austral Ornithology". Royal Australasian Ornithologists' Union. 2011. Retrieved 18 July 2015. ^ "Emu set for television comeback". BBC News. 8 June 2006. Retrieved 18 July 2015. ^ "Emu population in the NSW North Coast Bioregion and Port Stephens LGA". New South Wales: Office of Environment and Heritage. 22 October 2012. Retrieved 15 July 2015. Eastman, Maxine (1969). The life of the emu. Angus and Robertson. ISBN 978-0-207-95120-6. "Emeu" . Encyclopædia Britannica (11th ed.). 1911.